​A Hunger For Heaven was written by Dr. Jack Warren about losing his only daughter in a motorcycle mishap and the tremendous grief that followed. It gives an emotional account of the transition from grief to hope in the promises of the Bible and distinguishes between the present heaven, or intermediate state, and a future heaven. Several reader comments are at left below. 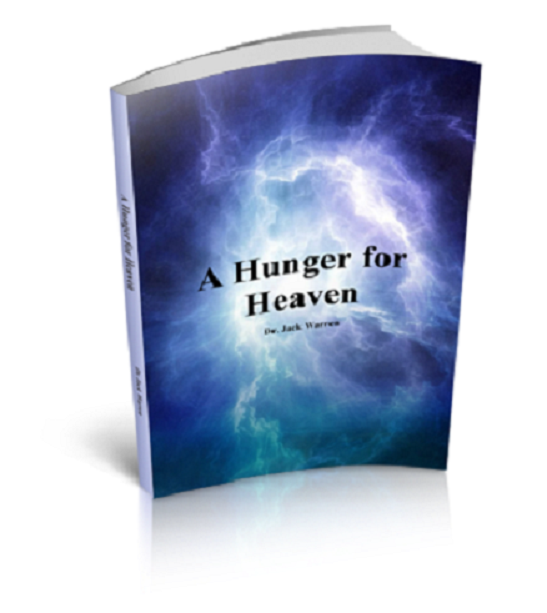 To order, click on BOOKSTORE at the top of the page, order A Hunger for Heaven and pay $8.50, which includes postage. ​Other books are also available at the bookstore. Pastor Jimmy E Nelson said: "Every day people deal with the tragedy and hurt of losing a loved one. And to be very honest there are very few books and pamphlets that deal with the issue. Dr. Warren did a wonderful job of sorting through his own pain and suffering and putting into print a tremendous resource of information that will aid both pastors, as they help those in their churches, as well as individuals going through these circumstances - from a Biblical perspective. Jim said, "...got your book yesterday and finished it this morning; it was very moving. I hope the Lord will use it to reach someone, somewhere for his purpose. I think you covered about everything in the book. Our heavenly Father knows - what happens is for our good and his eternal purpose." Cara said, "I read your book and loved it. It really opened my eyes to a lot and really made me grateful for what I have. The Lord is amazing and who wouldn't want to praise him one day (Lord willing) in heaven. I can relate to the grieving... because I lost my dad 9 yrs ago and it's still hard when I think about him and wish he was here. Thank you so much for sharing your book with us and Julie's story." Judy said, "Because to know Julie is to love Julie, it has been hard for me to read very many pages at a time. It's like reliving it. I know I will...find peace and wisdom from your words." Mary Ann said, "Thank you so much for sending me a copy of your book. I am overwhelmed with your knowledge of the Bible and wish we lived closer to you and Sue and your church. Listening to you share the gospel with your congregation would be helpful and very enlightening to me. Of course your book is one of a father deeply missing a daughter and looking to God for help in dealing with a loss that is overwhelming." "Tara said, "Thank you for sending ("A Hunger for Heaven"). I actually just came across a picture of her and me on my wedding day, and like it says in the summary of the book, it just hits you." Thomas said, "Sir, thank you for...A Hunger for Heaven. I am certain that your goal of helping others deal with grief is being met in the gospel-centered message conveyed, along with the very compelling personal story, within the pages of your book. Just one example, on page 131, 'You who mourn, look not within yourselves but unto the Savior. He is not only our Defender and Redeemer, He is also our intercessor.' You then go on to further proclaim the love, and excellencies, of our Savior, Christ Jesus! Wonderful!" Oleta said, "I am sorry about your loss. I wanted to thank you for all the teaching about losing someone and giving all the passages in the Bible to read. I have lost so meny brothers and sisters. Death is beautiful when you understand God's plan. I wanted to tell you that I sent the book to some one else who needed it more." Melinda said, "I'm more than half way through A Hunger for Heaven. Unbelievable! I remember so much of this book as it took place. The love a daughter has for her father is untouchable." Dr. Gerald Harris, Senior Editor of the Christian Index, recently wrote an article with the above title. It caught my eye because I had already been knocked for a loop reading attacks on Paige Patterson in our local Fort Worth Star-Telegram. The paper vilified Patterson in the harshest of terms for something he said in a sermon decades ago before becoming president of Southwestern Baptist Theological Seminary, which they interpreted as sexist. But part of what Dr. Harris said in this article brings that issue right to the doorstep of the SBC by suggesting that the convention would largely agree with our local newspaper. He did that by pointing out that "the new emphases subtly infiltrating Southern Baptist life seems to be social justice, the social gospel, feminism, tolerance, and intolerance." Before I get to that, let me say that Dr. Harris prefaced those observations by reminiscing about the 1990 Southern Baptist Convention and compared it to the 2018 convention. He said "I have had over a month to process the events of the most recent Southern Baptist Convention...and for me it was a Café du Monde experience. The only difference is that I felt like I smelled the aroma of death unto death - at least for the SBC I have known..."
He said "The Southern Baptist Convention is not just changing; it has changed. Many will consider it a blessed conversion. Others will feel disenfranchised, marginalized, and excluded...I feel like a voice crying in the wilderness." He said that he grew up listening to R.G. Lee and W.A. Criswell, men of God who preached with "great conviction, emotion, and passion. Southern Baptists were all about evangelism and missions for many years, but in the last decade it seems that we have changed our focus...[T]the new emphases subtly infiltrating Southern Baptist life seems to be social justice, the social gospel, feminism, tolerance, and intolerance." I am very sensitive to what Dr. Harris had to say about those five issues, because more important that being traditional among Baptists, it is biblical. The subject of his second point, the social gospel, is one of my greatest antagonists. Dr. Harris said, "The social gospel...has surreptitiously found its way back into our denomination. The social gospel embraces ministries that provide help to the needy – clothes closets, food banks, and health-clinics – almost anything that would contribute to the welfare of society. Churches should be engaged in these social ministries, but these ministries should not be the primary objective. Good deeds are important, but there are countless service organizations that help the public. Christians not only have the privilege of putting a man in a new suit, but putting a new man in a suit as a result of the change wrought by...the Gospel." Well said! For his third point, Dr. Harris said, "Southern Baptists seem to be welcoming a feminist movement in the church. He said, "It has been rumored that one of America’s most notable Bible teachers, Beth Moore, should become the SBC president in 2020. If she did, she would be placed in a position of preaching the president’s sermon. The Bible does not support the practice of women serving as pastors or teaching men (I Timothy 2: 12), but the intrinsic value and extreme giftedness of women have throughout history fortified and enhanced the ministry of the Holy Spirit in the church." I am going to go one step further and say that in addition to Beth Moore being unqualified to preach, she is also a heretic who has visions and aligns herself with Joyce Meyer and Joel Osteen. Lastly, Dr. Harris talks about the intolerance toward opposing views. In particular, he wrote about the disrespect shown toward the Vice President of the United States during the 2018 SBC. While we all have our opinions, to which we are entitled, we should always show respect to those of opposing views, especially a Christian brother. And as much as we disapprove of the actions of the wicked, there is no need to hate them. We need to pray for their enlightenment and conversion. In conclusion, Dr. Harris quoted W.A. Criswell who predicted the demise of Christianity in the following statement: "He (Dr. Criswell) said then and I believe he would say now, 'I believe it is time for every pastor and church member to call upon God to intervene on behalf of his church' and I believe we need His intervention in the life of our Convention."